Amidst a pantheon of high end men’s shoes, Gravati is one brand that often gets overlooked. Yet, anyone who owns a pair will tell you that Gravati is the most comfortable shoe in their collection. Gravati was founded in 1909 in Milan, Italy. While the brand maintains a cult following in Europe, Gravati was relatively unknown in the United States until the late 1990s when it began raising brand awareness by hosting trunk shows. These attempts, however, never caught on with the stateside shoe loving crowd largely due to uninspiring designs and relatively high prices. Truth be told, Gravati collection examined as a whole leaves much to be desired. While on the eclectic side, Gravati is not as interesting when compared to other Italian shoemakers like Sutor Mantellassi or Santoni. Some models, however, look quite nice and are incredibly comfortable as I recently discovered. My introduction to Gravati came in November 2007, while shopping with my mother in one of her favorite shoe stores. While I knew nothing about the brand, two shoes really caught my eye. After trying on both pairs, the shoes looked and felt impeccable, and for the price – a little over $200 each – they became an easy purchase (I bought another pair since then). 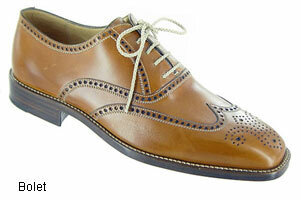 The tan wingtip is called “Bolet”. It is made out of betis leather, which in the words of a fellow sartorialist “is an aniline calfskin that has been treated with alcohol to disrupt the finish and then had neutral polish worked in with a buffing wheel to effect the antiquing.” As seen from the photos, the shoes are heavily brogued and could pass for a model out of a Sutor Mantellassi catalog. I wear them with a summer tan suit, but they could also work well with jeans or slacks. The black wholecut is called “Sera”. 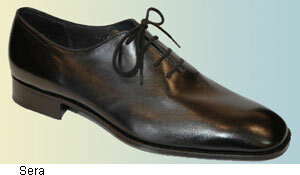 It is made out of Nappa leather, and is a versatile pair of dress shoes that can be worn to any formal occasion. Both shoes are blake constructed and have a leather outsole. A heel toplift if made from rubber with a stamped Gravati logo – a Gravati trademark for leather soles. It adds support on slippery surfaces. When trying on a Gravati shoe, one cannot help but notice how supple the leather is. Hence, my main concern before the purchase was how much wear they could take. Yet, almost nine months later, both pairs look as new (I must add, however, that I only wear each pair three to four times a month). While I am not familiar with Gravati lasts, the shoes fit true to size. In addition, wearing Gravati is an experience all in itself as they hug your feet and give you great comfort and support unlike any other high end pair of shoes I own. The three retailers that carry the largest selection of Gravati shoes in the United States are: Wilkes Bashford in San Francisco, Harolds in the Heights in Houston, and Zappos.com. These retailers’ prices, however, are a bit on a steep side, as Gravati can often be found on eBay or in a number of independent retailers for almost half the amount as the brand is still relatively unknown. Thus, if found in the $200 price range, Gravati is a great investment, as the leather quality and the overall comfort will leave one a very happy customer. Michael Snytkin grew up in Europe and fell in love with fashion from the young age. Now, an attorney in Florida, Michael balances his wardrobe between traditional and modern, and constantly strives to improve his style. I wasn’t aware of Gravati brand. I’m looking for some new business shoes this autumn and I’ll give these a try for certain. Thank you Mr. Snytkin for the fine article, and recommendation of Gravati. I like the Gravati Sera very much. I plan to seek out a pair in that color you have shown. I am also looking forward to reading more of your articles in the future.